Flights to famous Bermuda, a British Overseas Territory in the North Atlantic Ocean, are available when using the promotional deal of United Airlines and their Star Alliance partners. (US visa or ESTA necessary). If you are looking for exotic destination that offers one of the most beautiful white (or even pink) sand beaches in the world this is great opportunity. Roundtrip flights from Dublin or Shannon that are routed via USA (long layover in New York on an outbound) are available from €468..Fare is inclusive of all taxes, meals and hand bag as well as 23kg checked bag. If interested in this deal you will find limited travel dates when departing from Ireland to Bermuda at the end of April and in May 2019. Min stay: no departures than first Sunday after arrival. Max stay 12 months by also limited by tariff restrictions. Two free stopovers available. Base fare includes 23kg bag in hold. Fare class “K“. United promo sale is running till 30th of April or until sold out.. The cheapest deal is based on direct booking with United Airlines. The quickest way to track all available travel dates is via Google Flights (Guide). Bermuda is offenly considered as Caribbean destination but in fact its far too North so if you would decide to fly there in winter months we recommend to check what the weather is like before you book. If interested in this offer you can refer to our booking samples below. Accommodation. : Firstly please note that Bermuda is definitely not a budget destination. To make some basic idea what is the price for accommodation in Bermuda like you may use Booking.com. or consider following promo codes. Hotels.com, Hotelopia or Venere. Travel dates granting the lowest fare are available at the beginning of classic tourist season. (Main season in Bermuda when you can expect tropical climate as best time to visit famous Bermuda is considered from April to September. You should be able to find plenty of activities to enjoy your stay at this fabulous island. Above cities are well connected by many low-cost carriers so this is also a good option for travellers from other European countries looking for some luxurous holidays for relatively low price. Check our your connection possibilities via Skyscanner. 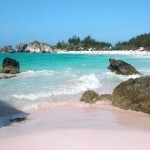 Booking sample of cheap roundtrip flights to Bermuda from Ireland for €468. In this case you would be flying from Dublin to Hamilton via New York on 25th of May and returning from Bermuda back to Europe on 8th of June 2019.